Do you have any symbolic links there? Xdebug will send final (resolved/real) path and not symbolic link. With this you don't really need any bookmarklet/browser extension/etc to start debug session as xdebug should attempt to connect to debug client on every single request (you may notice about 1 sec delay for page to be processed). 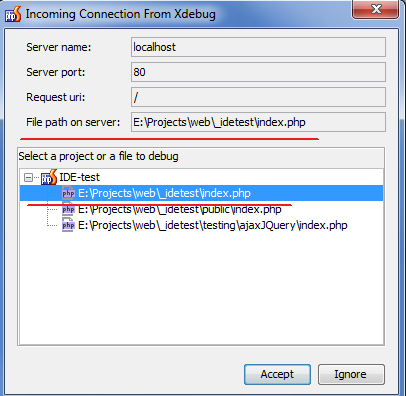 Same with Run/Debug configuration (PHP Remote Debug) -- you can just use that "Start Listening for PHP debug connection" button (the one with phone handle icon) to start debug client .. and then just initiate debug session from browser (or it should be initiated automatically with that autostart option On). is it a bug and should i report a bug? xdebug version? I suggest using latest stable which is 2.2.1. Delete your "Run/Debug Configuration" as well as "Server config" (Settings | PHP | Servers) -- those on screens #1 and #2 in original post. Activate "Run | Start Listen PHP Debug Connections" (or the icon with phone handle on main toolbar). Make sure that "Ignore external connection ..." option is unchecked! If necessary, activate debug session via Bookmarklet or browser extension and reload the page. I do see 2 index.php files opened -- one tab has normal backgound while another has yellowish background color. Can you please show the full path for each of those files -- use "Navigate | File Path" on each of them (post 2 screenshots here). BTW -- I do not see any breakpoints set on your very first screenshort. I'm thinking -- xdebug may connect to PhpStorm just fine .. but since there is no breakpoints .. it will just run as normal. But .. for external (outside o fproject) script, it forces to break on first line (as shown on your latest screenshot). 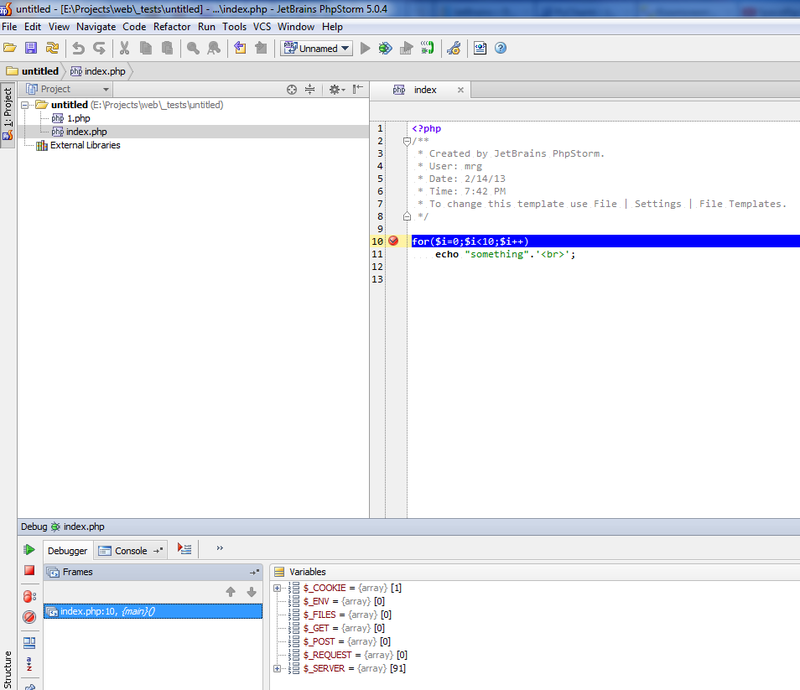 Both projects are working (debugging) just fine here on my computer -- no modification to project settings at all. Where do you put breakpoint(s)? Breakpoint got triggered on for line .. but does not trigger on echo line (for whatever reason). The only other thing I may suggest (considering that you do everything else properly) is to try v6 EAP build. Does debug works in CLI mode ("PHP Script" type of Run/Debug Configuration) ?